Dan Williams provides 100% Individualised CrossFit Programming to cater for your specific goals. Detailed and all-inclusive weekly remote CrossFit Programming and one-on-one athlete care – completely unique to you. For Elite, Intermediate and Beginner CrossFitters, Masters Athletes, FIFO Workers, Injured Athletes and CrossFitters training from home or a standard gym. We also offer a less individualised version, ‘ROMIP Lite‘. Contact us to discuss how we can help or scroll down to learn more. Tell me about the coach. 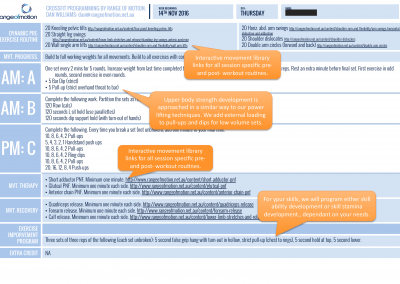 What’s Included in Range of Motion Individualised Programming? Biased towards YOUR goals and weaknesses. COMPLETE programming with all work capacity, Olympic lifting, power lifting and gymnastic elements. Goal and weakness specific accessory work. Extra swimming, plyometrics, sprint and agility training options all included. Round-the-clock online access to your coach, weekly video Q&A session, private Facebook group. 100% programmed for YOU. NO ONE else follows your unique programming - constructed for you every week. Unlimited access and communication with your coach, Dan Williams. Skill development and practice sessions. Session-specific pre- exercise routines, movement therapy and recovery work programmed daily. Unlimited weekly video analyses of your lifts and movements. I'm interested! How do I find out more? 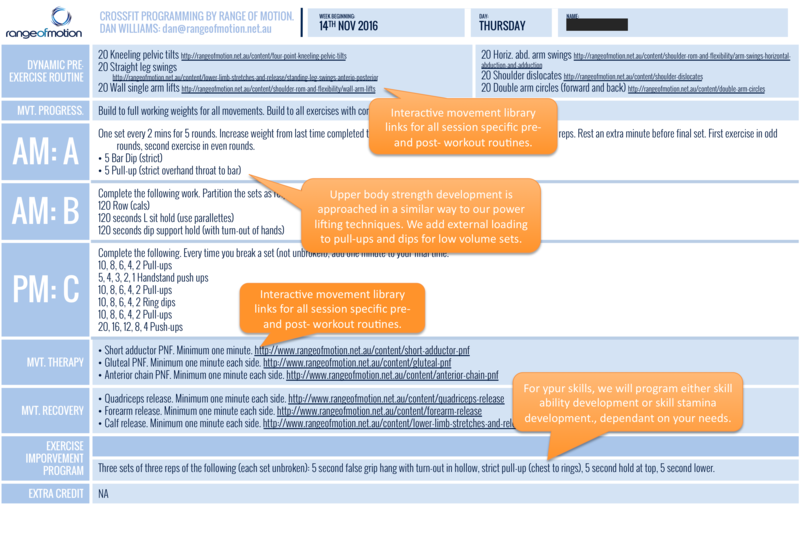 How Does Range of Motion Individualised Programming Work? Complete our detailed questionnaire to tell us your strengths, weaknesses, goals and individual requirements. We get to work profiling you as an athlete, and create a program biased towards your unique needs. We begin with start of cycle testing. Every week we construct and email you your all inclusive individualised program which evolves as you develop and improve. Your program draws from Olympic weightlifting and powerlifting, gymnastics, work capacity, skill development and accessory work – all tailored to you. Extra credit swimming, plyometric, agility and sprint sessions are included weekly to maximise your development. All pre- exercise routines, movement therapy and recovery work is included, keeping your body healthy, moving well and injury free. You have full online access to your coach, weekly video analyses, weekly live video Q&A session and a private Facebook group. 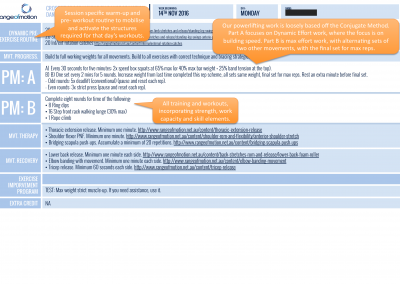 Post training cycle testing measures improvement and we construct you a detailed performance report before evolving your program. 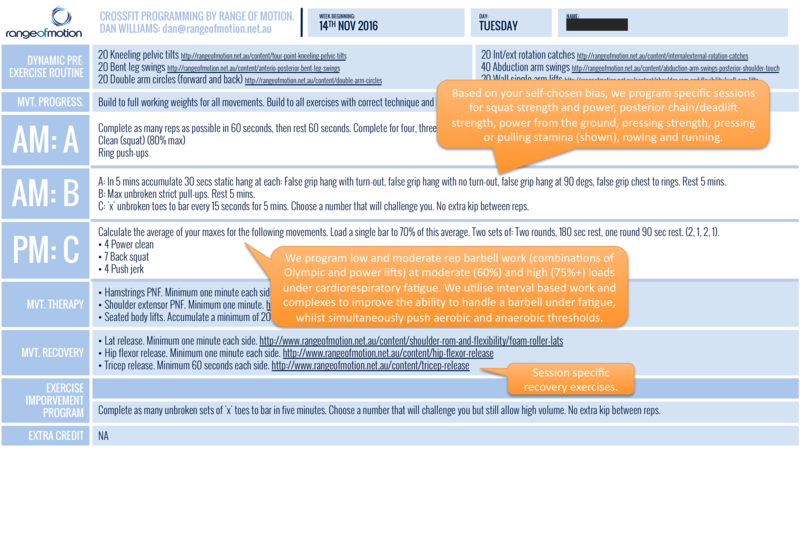 Who is Range of Motion Individualised Programming For? Are you a CROSSFIT ATHLETE who wants to perform at an elite level? 100% unique, individualised and complete programming biased towards your strengths, weaknesses, and goals. Includes all training, skill development, accessory work, pre- and post- exercise routines, movement therapy, recovery work, swimming, plyometrics, and sprint and agility training. Weakness-based periodisation to peak you for competition. Programming customised for your available time. Stand-alone, all-inclusive programming, or programming to complement your CrossFit classes. Daily program changes as your body, mind and circumstances demand. 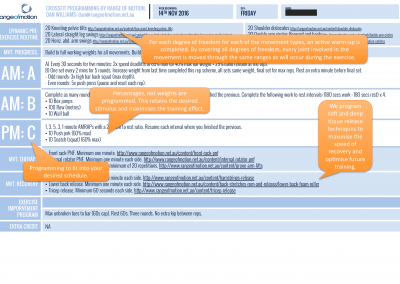 Injury rehabilitation and training modification. Round-the-clock online access to Dan Williams, weekly video Q&A session, private Facebook group. Are you a MASTERS CROSSFIT ATHLETE who wants to squeeze as much potential as possible out of your body? 100% unique, individualised and complete programming biased towards your strengths, weaknesses, and goals. 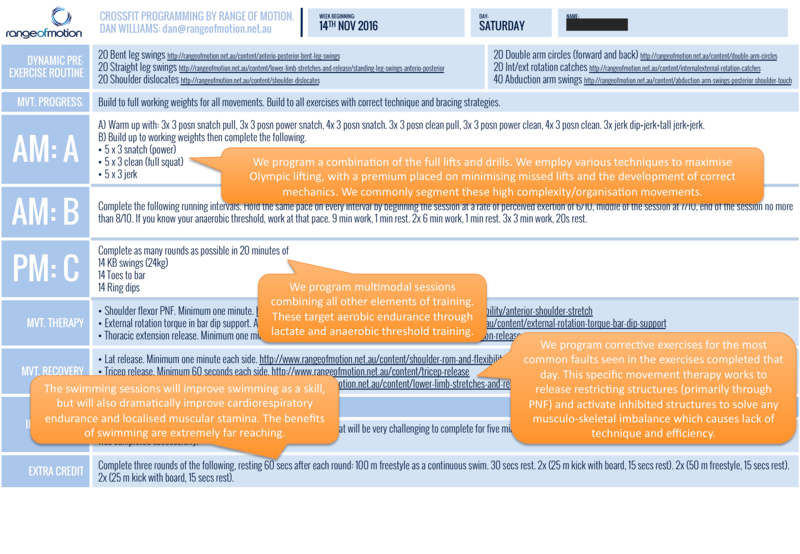 Programming customised for your available time, working around your responsibilities. 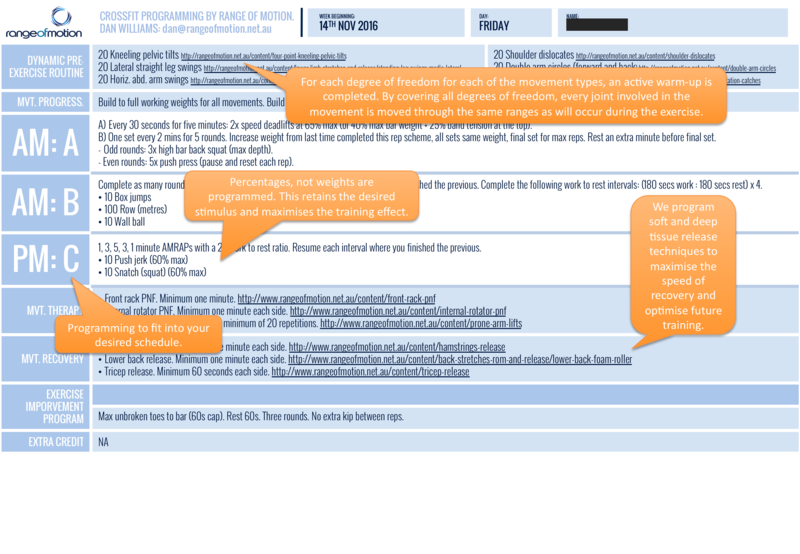 Individualisation of training sessions and movements based on your body’s unique limitations. Recovery and movement therapy programming tailored to correcting your personal muscular imbalances and mobility restrictions. Competition coaching and strategy (if you compete). 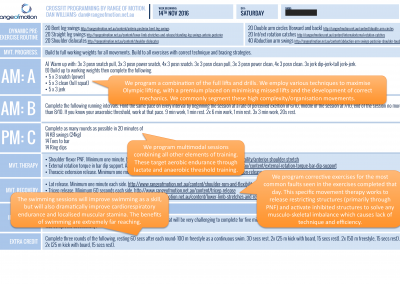 Are you a FIFO WORKER who needs a consistent and adaptable approach to CrossFit training? Programming customised for your work roster, time constraints, and equipment and facility limitations. Programming available 52 weeks a year, or just when you’re working away. Unlimited weekly video analyses of your lifts and movements so you can be coached even when training on site. Round-the-clock online access to Dan Williams, weekly video Q&A session, and a private Facebook group to interact with other people following a similar style of programming. Are you an INJURED CROSSFITTER, but don’t want to let it stand in the way of your training? Injury rehabilitation and training modification to make sure injury doesn’t stand in the way of your progress. Full support to assist you in dealing with the mental side of injury. Assistance in modifying the movements in your CrossFit classes so you don’t miss out on being part of the community. Gradual evolution of your programming as your recovery progresses. Do you CROSSFIT FROM HOME and need remote programming and coaching? Programming customised for your equipment and space limitations. Programming customised for your available time, working around your life and responsibilities. 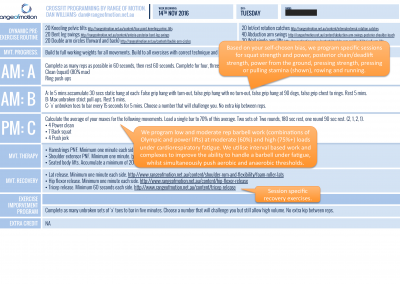 Daily program changes as your body, mind and schedule demand. Unlimited weekly video analyses of your lifts and movements so you can be coached even when training from home. The option to schedule video calls for real-time coaching. Would you like to do your best in LOCAL CROSSFIT COMPETITIONS, regardless of your division? Tailoring for all levels of athlete, from complete beginners through to top level athletes. Programming includes all training, skill development, accessory work, pre- and post- exercise routines, movement therapy, recovery work, swimming, plyometrics, and sprint and agility training. Competition guidance, coaching and strategy. Would you like to do CrossFit from a REGULAR GYM and still get coaching and programming? 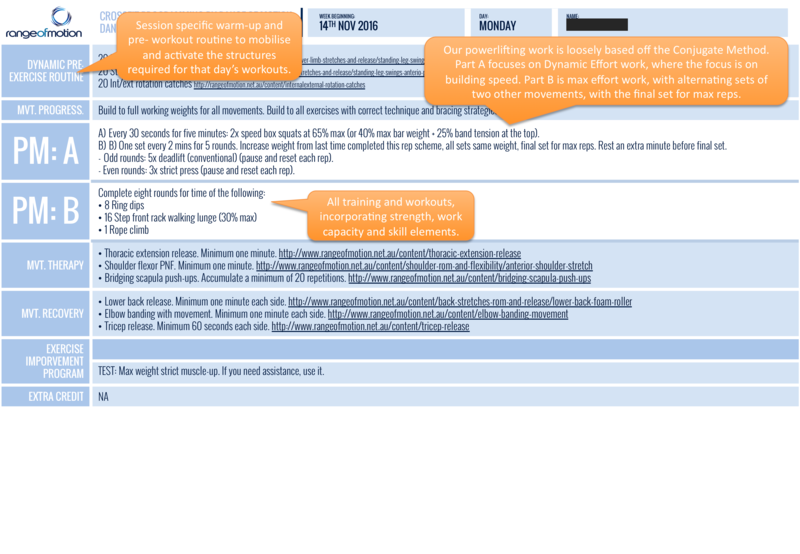 Unlimited weekly video analyses of your lifts and movements so you can be coached even when training remotely. The option to schedule physical face-to-face sessions with Dan for one-on-one coaching. Can I follow ROMIP and still do classes? Absolutely. We know how important classes are for some people, so we’re able to program around the classes to ensure you still get maximal benefit. How do I receive my program? 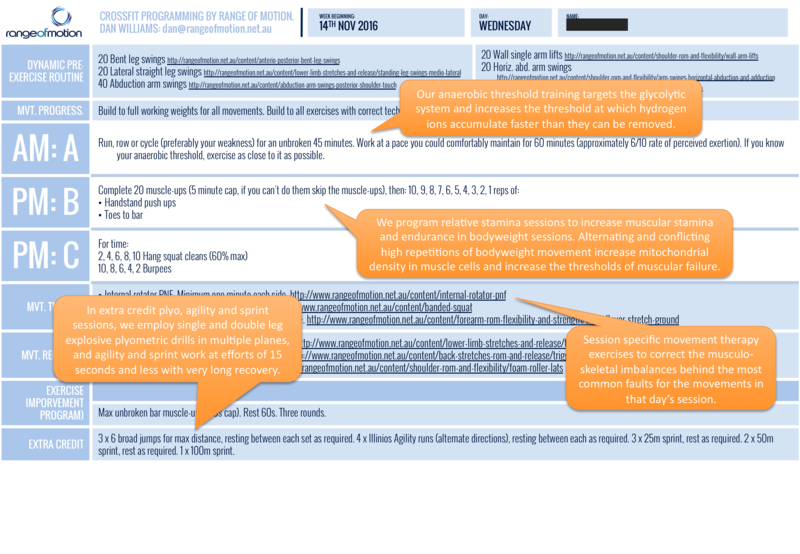 You’ll receive your individualised program by email every week. How much does ROMIP cost? You get full individualised programming, all inclusive, including full access to Dan Williams, for $60 (Australian) per week. There are no contracts. Pay as you go. If you’re looking for a cheaper option, check out ROMIP Lite. Six days a week, two sessions are posted for your specific bias. While ROMIP Lite contains only programming, and not the other privileges of being a ROMIP Athlete, it allows access to high quality, biased programming, at a lower price option. 100% programmed for YOU. NO ONE else follows your unique programming – constructed for you every week. How Can We Help? How Can We Help? I'm ready to start ROMIP Lite next Monday. I'd like to be contacted with more details on ROMIP Lite. I need more individualised care from the full version of ROMIP. 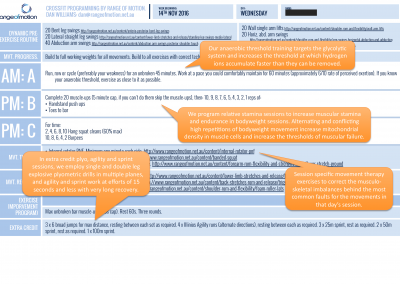 What do Range of Motion Individualised Programming Athletes Think? 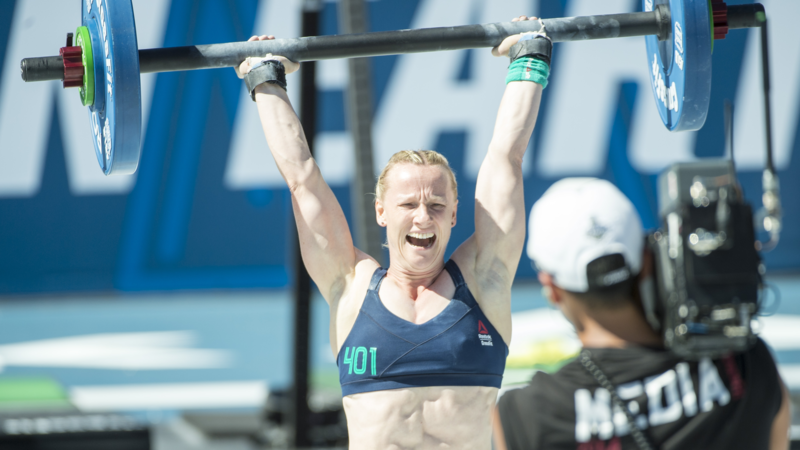 Helen Harding, 2x CrossFit Games Champion, ROMIP Athlete. Leanne Brennan, Darwin, ROMIP Athlete. Paco Gonzalez, Affiliate Owner, ROMIP Athlete. Casey Stamm, ROMIP Athlete, Washington, USA. Cal Foster, Regionals Athlete, ROMIP Athlete. 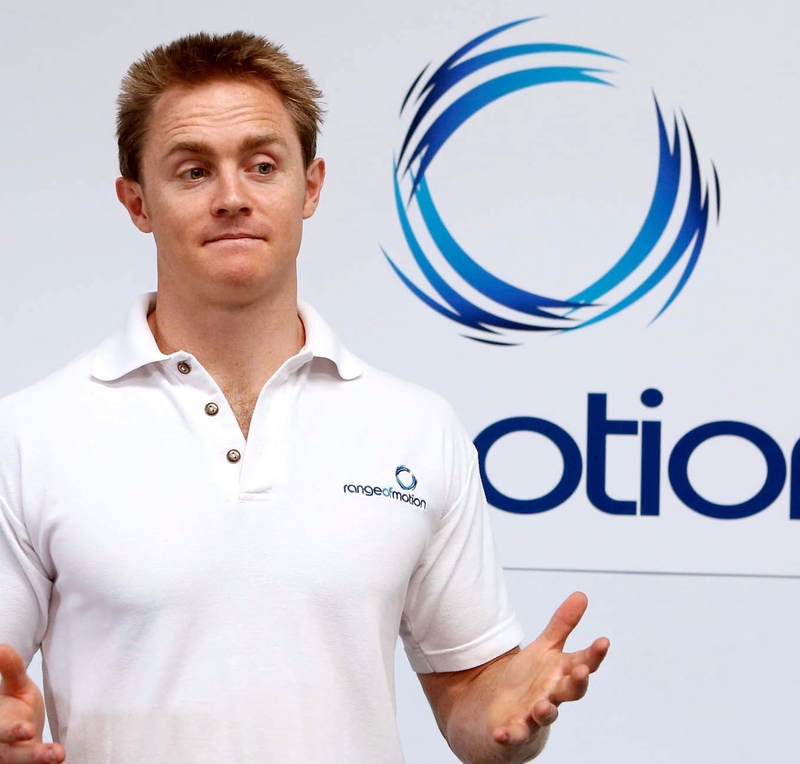 Who is the Head Coach of Range of Motion Individualised Programming? Dan Williams is an Exercise Physiologist, Exercise Scientist and CrossFit Affiliate Owner. Dan has the combination of experience and expertise to create the highest quality of programming. He is a three-time CrossFit Games coach (Helen Harding 40-44 Masters Champion, 2016 & 2017 and Denae Brown, 2014, 2017), four-time CrossFit Regionals coach, and four-time CrossFit Regionals athlete. Dan is the Director of Range of Motion, Co-Director of Fitness Educators, and Co-Director of My Fitness File. He has a Bachelor of Science (Exercise and Health Science) and a Postgraduate Bachelor of Exercise Rehabilitation Science, with minors in Biomechanics and Sport Psychology.